The Mercer County District Library is please to announce the placement of its first “Little Free Library” with the help of Zach Harting. As part of his Eagle Scout project, he planned, built and placed the “Little Free Library” and a bench at the Montezuma Park. 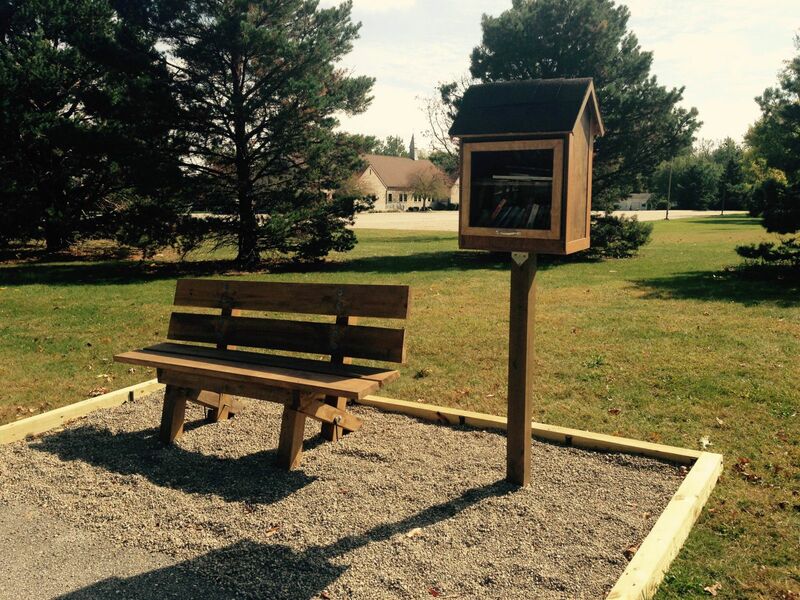 The Mercer County District Library has been looking for a way to better expand their reach to the south side of the lake and had researched Little Free Libraries. “When Zach approached us for an idea for his Eagle Scout Project we knew he would be able to bring it to reality” said Elizabeth Muether, Director. “We are very excited to see this through.” Zach’s Little Free Library will be stocked with donated books from the Mercer County District Library. When visitors take a book they are encouraged to leave a book in its place. Muether plans to monitor the little library and stock it as needed. The Little Free Library in Montezuma is part of a worldwide book exchange. According to their website www.littlefreelibrary.org, their mission is “To promote literacy and the love of reading by building free book exchanges worldwide… There are over 32,000 Little Free Library book exchanges around the world, bringing curbside literacy home and sharing over 1 million books annually.” Muether hopes to partner with other individuals and organizations to build more Little Free Libraries in Mercer County. If you are interested or want more information, contact her at the Mercer County District Library. 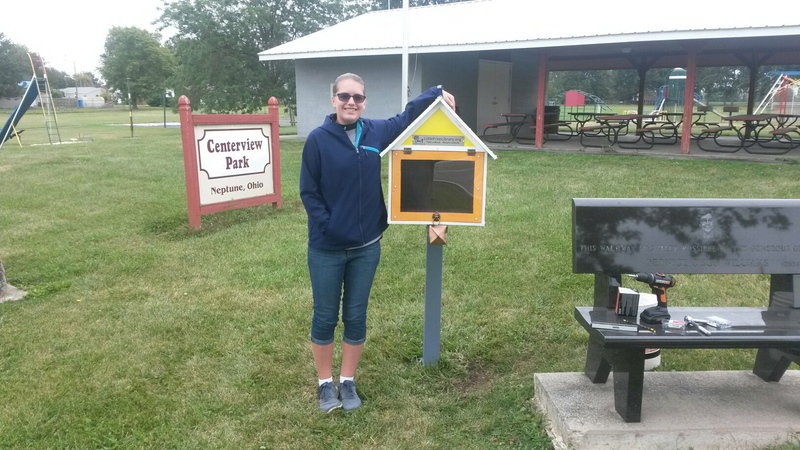 The Mercer County District Library is pleased to announce the placement of its second “Little Free Library” with the help of Hailey Siegrist. As part of her Girl Scout Gold project, she planned, built and placed the “Little Free Library” at the Centerview Park in Neptune. The Mercer County District Library continues to look for ways to better expand their reach to smaller rural areas outside of Celina and after the placement of its first Little Free Library in Zuma in 2015, were happy to support Hailey’s project. “When Hailey approached us for an idea for her Girl Scout Gold Project we were excited she would be able to expand our Little Free Libraries” said Elizabeth Muether, Director. “We are grateful to Hailey for her hard work.” Hailey’s Little Free Library will be stocked with donated books from the Mercer County District Library as well as books Hailey has collected. When visitors take a book they are encouraged to leave a book in its place. Muether plans to monitor the little library and stock it as needed. Muether hopes to partner with other individuals and organizations to build more Little Free Libraries in Mercer County. If you are interested or want more information, contact her at the Mercer County District Library. Pictured is Hailey by the Little Free Library. The St. Henry Branch of the Mercer County District Library is proud to announce the opening of the newest Little Free Library throughout Mercer County. As part of his Eagle Scout project, Nathan Howe, built, planned and placed the Little Free Library at Burkettsville Park. 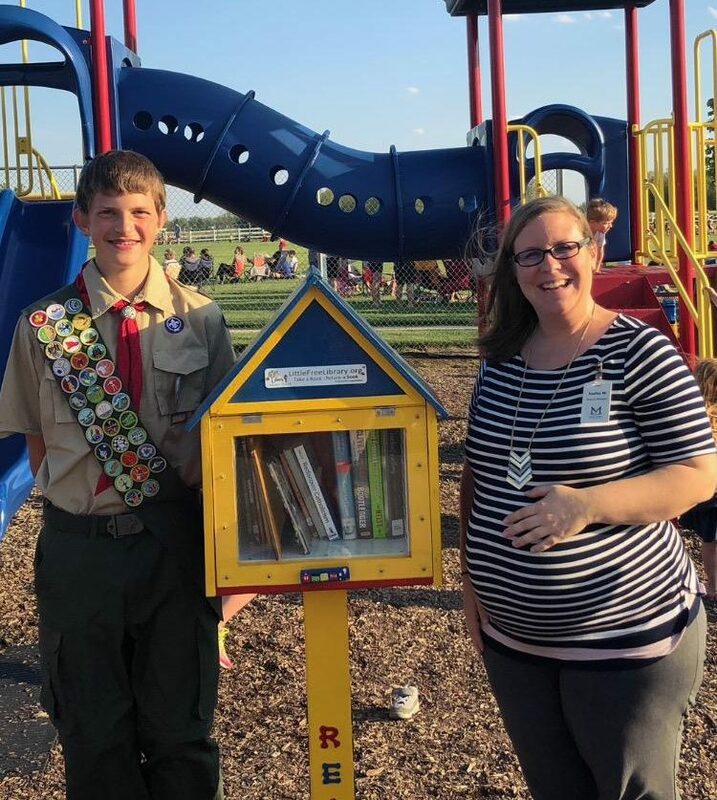 “As a branch, we were very excited that Nathan was willing to help us in our endeavor of creating our first Little Free Library,” said Keshia Willmann, Branch Manger. Nathan’s Little Free Library will be stocked with books that have been donated to the St. Henry Library. The idea behind Little Free Libraries is to provide easy access to books for communities in which a physical library is not within walking distance. Visitors are encouraged to take a book, and to leave a different book in its place. Willmann plans to monitor the library and to stock it as needed. If you are interested in establishing a Little Free Library throughout the St. Henry area or want more information, contact her at the St. Henry Library. Pictured is Nathan and Keshia by the Little Free Library.